This is a musician’s tale: the story of a boy growing up on the Iron Range, playing his guitar at family gatherings, coming of age in the psychedelic seventies, and honing his craft as a pro in Minneapolis, ground zero of American popular music in the mid-eighties. “There is a drop of blood behind every note I play and every word I write,” Paul Metsa says. And it’s easy to believe, as he conducts us on a musical journey across time and country, navigating switchbacks, detours, dead ends, and providing us the occasional glimpse of the promised land on the blue guitar highway. His account captures the thrill of the Twin Cities when acts like the Replacements, Husker Dü, and Prince were remaking pop music. It takes us right onto the stages he shared with stars like Billy Bragg, Pete Seeger, and Bruce Springsteen. And it gives us a close-up, dizzying view of the roller-coaster ride that is the professional musician’s life, played out against the polarizing politics and intimate history of the past few decades of American culture. Written with a songwriter’s sense of detail and ear for poetry, Paul Metsa’s book conveys all the sweet absurdity, dry humor, and passion for the language of music that has made his story sing. Paul Metsa is a legendary musician and songwriter from Minnesota. Born on the Iron Range, he has been based in Minneapolis since 1978. He has received seven Minnesota Music Awards and has played more than five thousand gigs, including forays to Iceland and Siberia. He lives in Northeast Minneapolis with his faithful dog, Blackie; a dozen or so guitars; twenty-five orange crates of LPs; hundreds of books, compact discs, magazines, and vintage postcards; and several kitchen cupboards full of old cassettes. David Carr grew up in Hopkins, Minnesota. He currently lives in New Jersey and writes for the New York Times. He is the author of The Night of the Gun. American rock and roll started around a campfire in a dark and howling wind. It was blues, country, and hillbilly music then. Once it was moved inside four walls--juke joint or gin joint, rent party apartment, greased alley garage, or some full-moon Ozark barn dance, it became rock and roll. First, gut-bucket whiskey passed around in coffee cans, then ordered over the bar, smoke from hand-rolled cigarettes misting blue windows, both inviting the night and keeping it at bay, beautiful women writhing with imaginary lovers on sawdust dance floors, young men on a weekend pass from some hell-forbidden job doing the Hucklebuck and the Chicken Strut, these sons and daughters then joining in this Church of Saturday night together, while the band in the corner jacks it up, like drill hammers toward heaven, until the sweaty crowd stumbles out sanctified and satisfied. Paul Metsa is a natural-born writer. He can write anything. Lyrics, letters, articles all flow out of him like an exotic, ferocious waterfall splashing down on all the senses. If he writes it, I read it. Metsa is a mountain in Minnesota music. Paul Metsa is a great artist. I always look forward to playing with him. The roads Paul Metsa has traveled are so fabled you might think, opening his book, that it would be a book of footnotes—the record of a man walking in other people's footsteps. But Metsa brings every myth the roads carry down to earth, rewriting their stories in real time, returning the roads to real life, opening them up again to both past and future. Fans will appreciate Metsa's stories about the writing and reception of many of his songs. More than simply a title of regional interest to Midwesterners, this musical journey will resonate with readers who prefer their tell-alls spiced with a generous helping of conviction and a dash of humility. 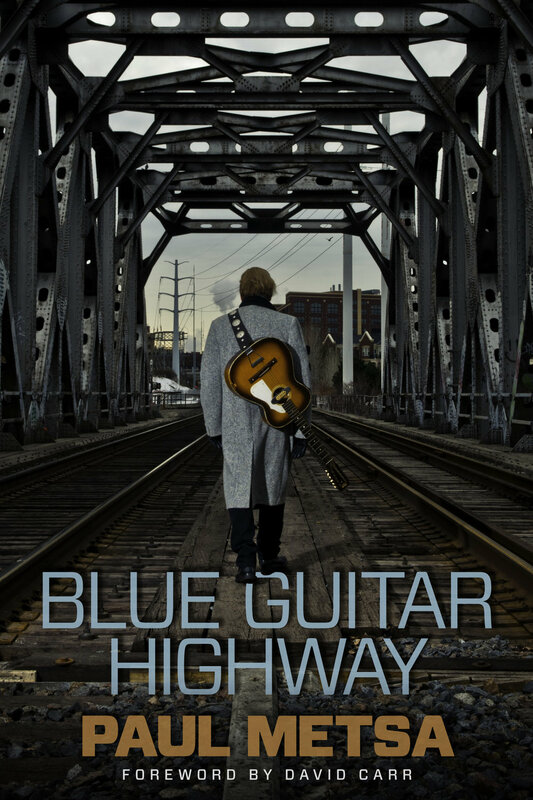 Blue Guitar Highway is a convincing testament to the strength that a performer can draw on by remaining in touch with his or her roots, while remaining open to the trials and rewards along the road of an America steeped in song. You've got to admire Paul Metsa. He chased his dreams and became an accomplished Minneapolis-based guitarist and songwriter. Although he’s often lived gig to gig, you sense from this memoir that he's loved the ride. Blue Guitar Highway has so many compelling stories that you can't put it down. Metsa’s style is readable, sometimes funny, sometimes lyrical, and full of passion. Blue Guitar Highway is . . . Paul Metsa’s equivalent of Bob Dylan’s Chronicles, Vol. 1. Metsa uses his talents as a songwriter and lyricist to full advantage. His prose sets us to laughing, crying, and remembering often within the same sentence... This memoir belongs on any music fan’s bookshelf. Reading the words of Paul Metsa as recorded in his memoir, Blue Guitar Highway, is a walk through the several decades of the local music scene with all of his and its connections with the ages and stages of American music writ large. While the 271-page work is full of telling, humorous anecdotes from Metsa’s life—including the time he slipped Grateful Dead front man Jerry Garcia some leftover, psychedelic mushrooms—the story’s primary message is one of perseverance and passion. Blue Guitar Highway conveys all the sweet absurdity, dry humor, and passion for the language of music that has made Metsa’s story sing. For music-lovers who admire the 80s and 90s in the Twin Cities rock-and-roll scene, Metsa’s journey is worth delving into. Blue Guitar Highway, by Paul Metsa will certainly please music buffs who remember Metsaʼs days in the joints on Minneapolisʼs West Bank. Packed with colorful details about music venues in Minneapolis and on the Range and with references to things uniquely Minnesotan, Blue Guitar Highway offers lots of local appeal. On a broader plane, Metsaʼs book is an anthem to professional musicians who live to play. His heartfelt tributes to those who influenced him in his musical pursuits are numerous. So belly up to the bar now and then, and get to know this gregarious Minnesotan, a born storyteller. Metsa writes so well that he can even make a hangover seem beautiful. Compelling, gripping and laugh out loud funny even as he describes some far from funny happenstance, Metsa takes us on his lifelong ride, from the death of his mother on an operating table, to his bust for cocaine possession, through a personal quest to save a beloved local theatre, all told within the roller coaster ride of a musician from whom “quit” is definitely not an option. He is Minnesota’s other Dylan. The anecdotes are entertaining, the self-deprecating humor is often captivating, and the music trivia is mostly entertaining to those of us who know little about the music and the culture of Minnesota in the middle of the last century.